Since it's the end of the month that means I have at least a couple of WIP's to get wrapped up. Primarily bee blocks to get done and in the mail. My Mid Century Modern bee block for Linda at Buzzing and Bumbling was the main one I wrapped up over the weekend. She requested a house block from all of us as a way to commemorate a tough year in 2013. Linda lost her home, including all her fabrics and quilts in a fire last year. I so hope these house blocks will come together into a beautiful new quilt to start her new year off in a much better place. I winged it with an improv style for the last house block I made and it came out pretty wild. This time I thought I'd try a more planned approach. I drew the block out first. 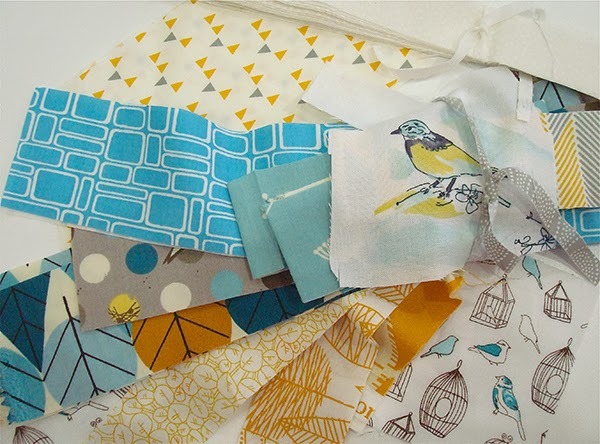 Selected fabrics based on Linda's cue and took it all to our guild sew day Saturday. It took me almost the whole day to piece. Paper piecing and I don't get along very well but I managed to get it done in between catching up with everyone. More talking at times than sewing. One advantage of waiting till the last minute to do this block was being able to add a little something extra based on a recent post Linda did about her roses. 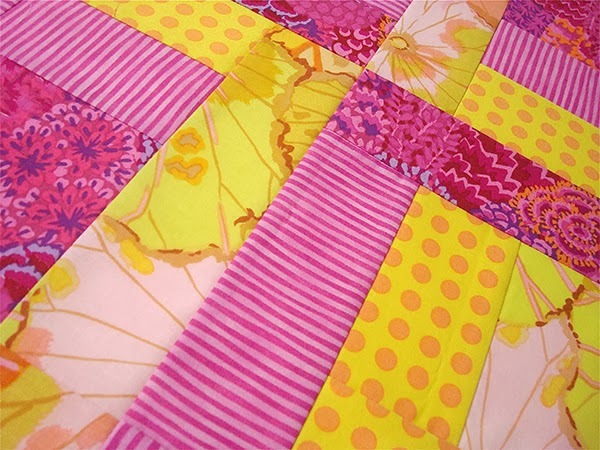 Take a look at the beautiful quilt she just made. I found some floral fabric in my traditional stash and added some roses that I hope will remind her of her old roses. I think they really finish off the block well. I've also added another bee to my schedule this year which should be fun. I'll be making a Mad Mosaic block for our Modern Quilt Guild bee. Should be fun since her fabrics are such a good mix of modern prints. Aren't these cute. I love the little bird. I actually love all things bird related. My biggest WIP this week is my art quilt for the Four-in-Art quilt group. If you read my earlier post this week, you know I really procrastinated on this one. It's coming along. Should be ready for the big reveal on February 1st. Come back to see how it turned out. I should know that it takes time for ideas to develop and gel into something worth doing. When I give an idea time to percolate, I get far far better results . . . at least most of the time. I know when I rush a project I don't produce my best, most creative work. I also know that I can be quite indecisive at times because there are just too many options. With this quarter's Four-in-Art project, I've had plenty of time. Three months to be precise. We are exploring the overall theme of Urban for the year and this quarter the specific topic is Structures. Early on I knew my structure would be highway overpasses. I just didn't bother to take my idea and explore it sooner when I had lots and lots of time. 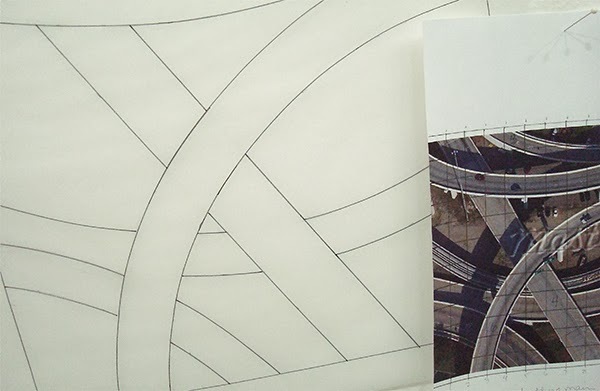 So now I have a photo image, a sketch and a pile of fabric. 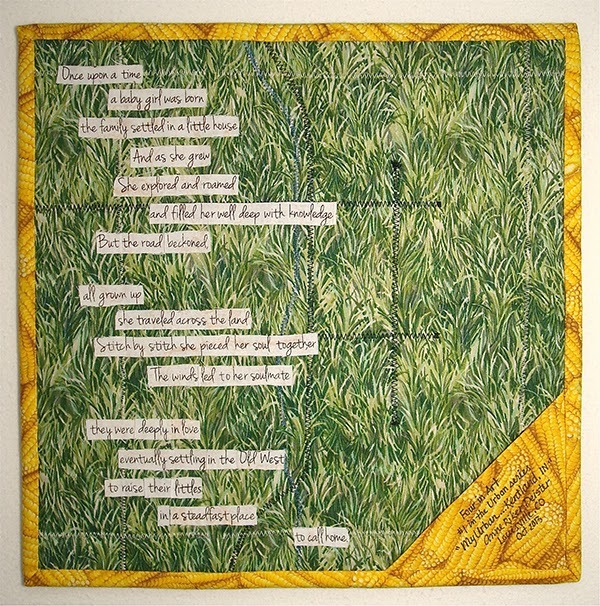 My gut reaction was something literal with grays and some green to tie it to my first art quilt. 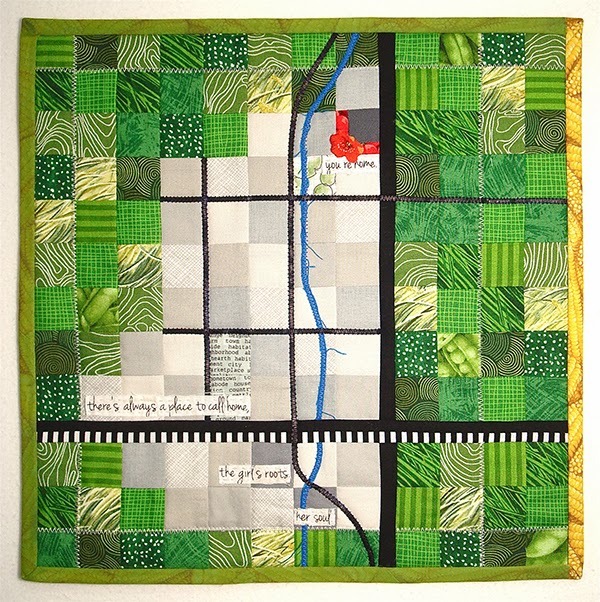 I like the idea of some continuity between each art quilt throughout the year beyond the Urban theme. Color seemed like a good way to tie them together. But in my heart I know this idea should become more. It has the potential to go beyond a simple visual depiction of overpasses and roadways. It has the potential to represent my own quilting journey. An inkling of true inspiration is starting to come together in my mind. Not a clue whether it will work the way I imagine. Only time will tell. But time has now become an issue. Time I do not have. And to complicate the time I do have is a construction method of piecing I have never tried. Truthfully I'm not even sure I can wrap my head around how to piece it. This is good. This is part of why I chose to join our little group. To challenge myself both artistically and technically. But new techniques also can take time. I don't know where this project will go right now. Hopefully the idea and the new sewing method will both work and I will finish on time. Join me on Saturday, February 1st and see how it all comes together. That day also happens to be my birthday so I'm counting on a good experience getting this done. See you later. Look what I found in my scrap drawer this afternoon. Meet Opal. She and her brother Leo have been with us for one whole year now. Can't believe how big they've gotten. Wish I could shrink them back to tiny kitten size. They both like to hang out with me in my studio. I love the furry company even if they do get into places I'd rather they stay out of. Today I came back up after lunch and was at the computer when I heard a sneeze, looked over and realized there was a kitty under the fleece throw on my rocker. Just a small little lump moving around completely under the throw. Later I found her snuggled up in the scrap drawer. As for WIP's . . . there are several things in various stages and a couple of things that need to get done by the end of the month. I'm in the midst of my next pattern and trying out some of the options I include in each of my patterns. This is a sneak peek at one of those options. I've loved the pink/yellow color combination ever since my daughter was little and had these colors in her room. So cheery and bright. With the end of the month looming, it's also about time I get started on my Mid Century Modern Bee block for Linda at Buzzing and Bumbling. She lost her home to a fire last year so she requested a house block from each of us to commemorate her "year of the house" as she is calling 2013. A new home is in the works and we are all wishing her the best. She has maintained an amazing attitude through the whole ordeal. 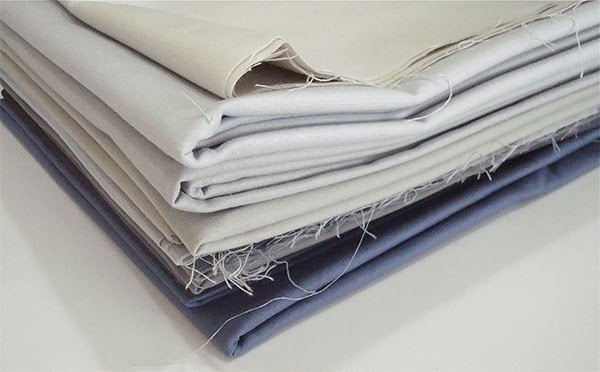 These are some of the fabrics I've pulled to build my house for her. Must make up my mind and get it done and in the mail. I'm curious . 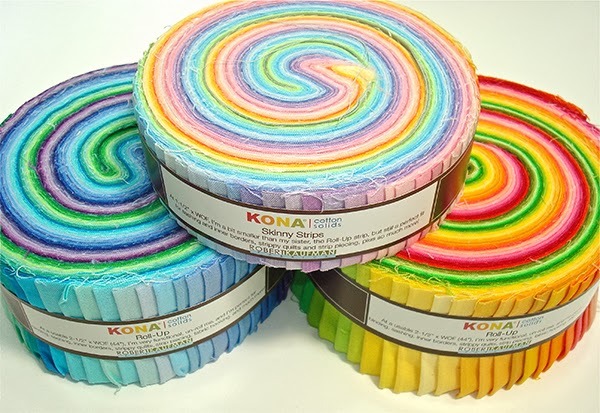 . . do any of you have as much trouble as I do choosing fabrics for bee blocks? We use our stash and scraps for this bee which is wonderful as we don't have to cut and ship fabric. Just make the block in the colors requested and send. Using modern fabrics is a given with this group. 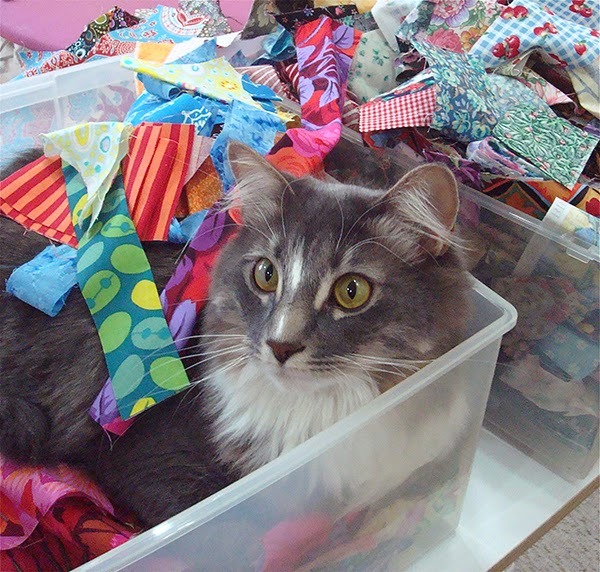 But sometimes I can have the hardest time deciding on which fabrics to use. So many choices. Will my choice work with the other blocks? Are they modern? What is modern? The good thing is I'm challenged to view my fabrics through someone else's eyes. I get to see how the others interpret each block request. 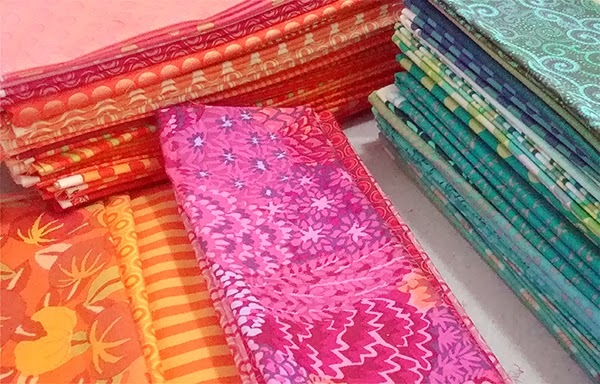 It's a great opportunity to learn about my own fabric selection process, explore my stash and even loosen up on my tendency to hoard certain fabrics. Can you relate? Looking down from above it wasn't really that obvious, but when I saw the bottom of her feet as she knelt down it was quite clear her shoes were pointed the wrong way. That's kind of how last week felt to me. From one perspective it seemed I was going in the right direction. I even made a couple of breakthroughs with my project. But taken from another perspective I realized I was perhaps starting on the wrong foot. Perhaps going about things backward. This is what it looked like while in the midst of it all. Actually it was far messier but I have no documentation to prove that point. My dilemma . . . what fabrics would best demonstrate the design on the computer? Should I use prints? I pulled way more than this and still couldn't decide. Should I use solids? I realized I don't have as many colors as I think I do. Should I use grays? I realized I don't have much range of values when it comes to my stash. Like the little girl, I didn't notice I was going about things backwards. Like the little girl, I will learn to discern the difference with more practice. 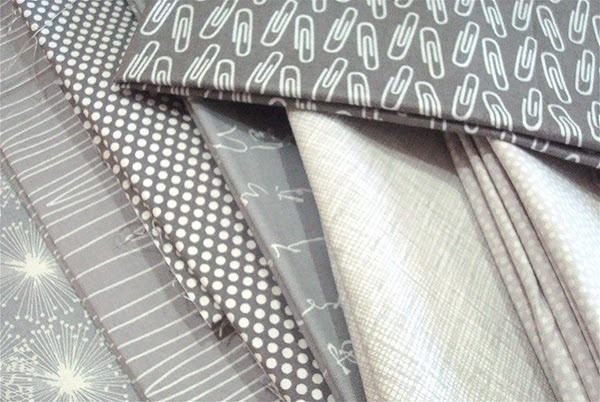 Like many of you, I can sometimes have a hard time choosing fabrics. That's what it boiled down to. Not being able to find the fabrics that worked with what I was doing on my computer. Starting with the fabrics instead of the design can sometimes be best. What I learned is that I'm quite prone to spending way too much time on my computer and not enough time with the actual fabrics. I need to spend more time playing with what inspires me . . . the color and pattern of fabric. And less time playing on the computer and being sidetracked. 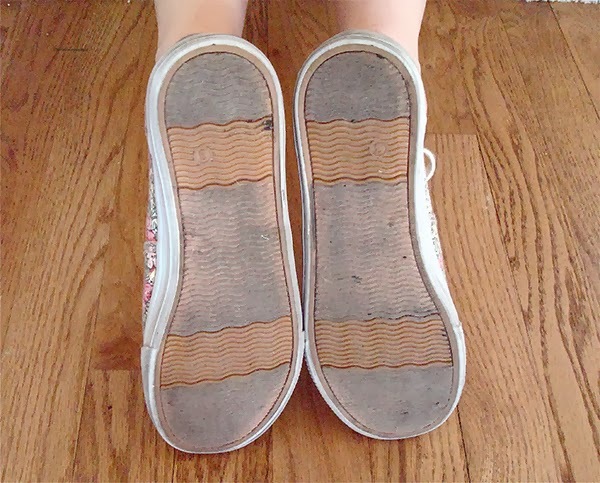 In the meantime, I will keep moving forward even if my shoes are pointing in different directions. Sometimes I might drift a little sideways, maybe even a step back now and then. I just need to remind myself that pursuing a wrong direction can help you find the right direction. It just takes longer. Linking up with Cindy's Really Random Thursdays . . . this seemed like a fit. Hop over and see what's up with the other links. Quilt Labels . . . do you or don't you? An example of one of the few labels I've done. 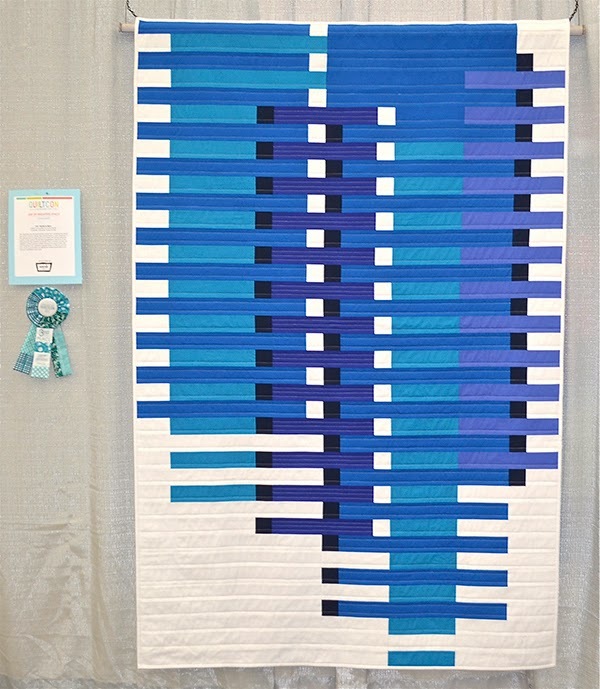 This was a charity quilt. About the only time I have labeled my quilts is when it's been for a show (and therefore required) or given away as a gift. For a quilt show they want complete information right down to your phone number and address which I wouldn't normally want to advertise. But it's always good to know that they know who the quilt belongs to. 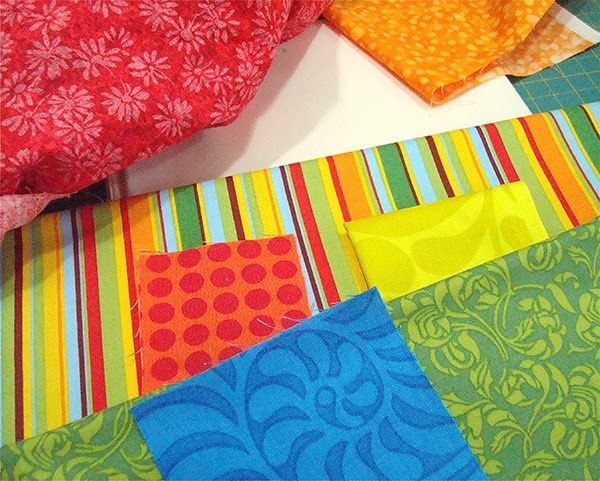 I want the labels for quilts I make for patterns and submissions to look professional. 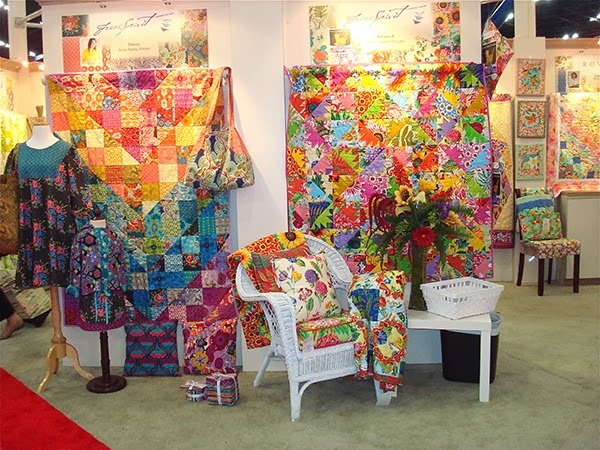 What I need is a label that will include my logo and website/email info along with the specific quilt info. I'm thinking of using Spoonflower to print up a yard of labels with my logo and basic info along with space to write in the quilt name, pattern name and date. 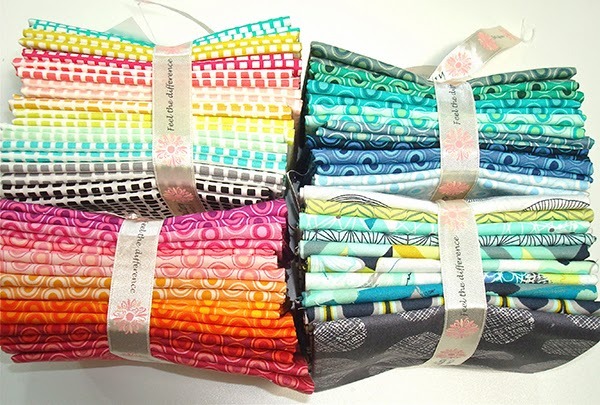 Julie of Jaybird Quilts has a tutorial using Spoonflower that I've been considering. I know I could also print my own but am quite leery about running fabric through the finicky printer we have. To tell the truth I don't think the hubs would even let me use our printer. So another printing option for a professional look is what I'm after and that's where Spoonflower comes in. I'm trying to decide what to include and would really appreciate your input. What size label do you use? Seriously I'm struggling with the size. Is 3 1/2 x 5 1/2 too big or not big enough when you factor in the need to hand write on fabric? What info do you always include? There are so many things that could be included it can become a short story in itself. These labels are mostly for quilts I'm making as part of my patterns/submissions. Perhaps to sell. Others will be gifts, charity or personal use at home. How do you attach your label? Have you used Spoonflower and if so any advice? Does it wear well when washed? Next time I'll put this little triangle label in the upper corner so it can do double duty as a hanging corner. Thanks so much for sharing. Feel free to share any photos of your labels. Westminster Fibers booth . . . one of my favorites. 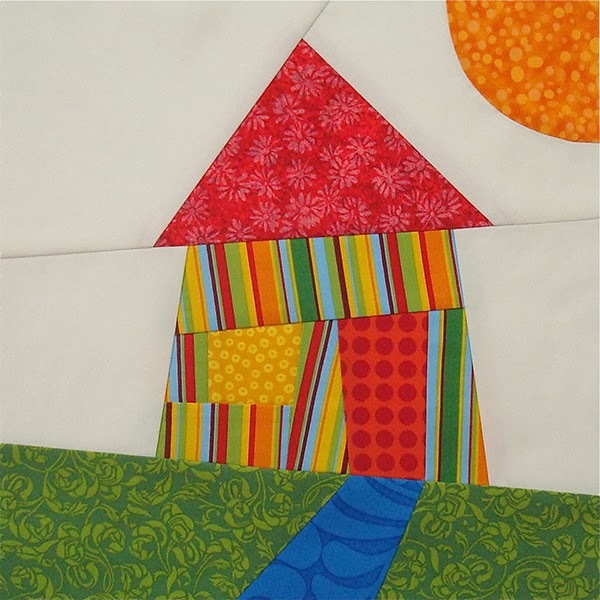 Another positive step for me in 2013 was meeting other quilters and stepping out of my little isolated world. 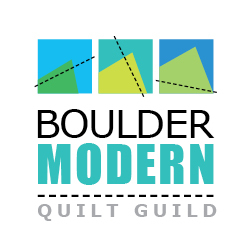 I became involved in the early stages of the Boulder Modern Quilt Guild and designed the logo. 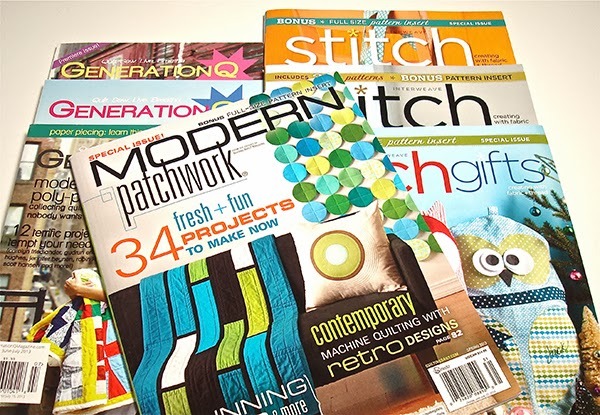 In 2014 I plan to refocus on pattern development and make it the year of patterns. I also want to expand my blog content to include tutorials as well as some type of design exploration lessons. The design process is what I truly love. Additional design options are a big part of what I include in my patterns. Now I'd like to share more of these design explorations with you here on my blog. One other thing I need to do in 2014 is use my stash! 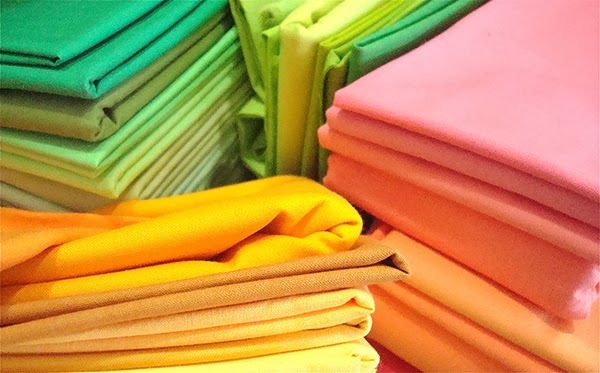 I probably have enough fabric to keep me sewing for years and yet much of it is not where my fabric tastes reside these days. What to do about that? Perhaps I'll open an Etsy shop just to destash. Perhaps I'll explore how this older fabric can be made into something more modern. Maybe it will even become part of a new blog series . . . traditional with a modern twist. 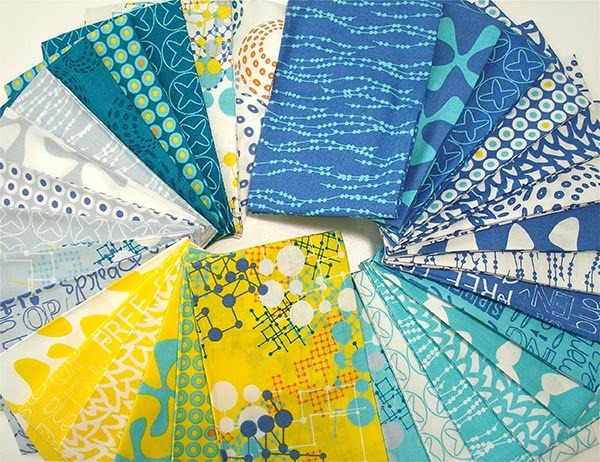 Here's a peak at some of the newer fabrics I plan to make good use of. I'm looking forward to stirring up some wonderful new things with some of these beauties. Hope you'll join me and see where the new year takes SpringLeaf Studios. 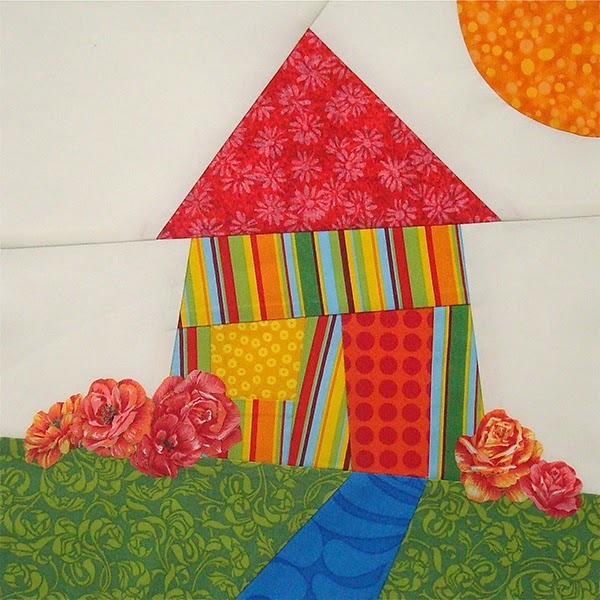 What are your quilty goals for 2014? I'll leave you with this quote seen recently on another blog. Apologies to which blog because I can't find the source.